In 1964 McCrabb Brothers Mfg. Inc. became a company in West Liberty, Iowa. The company started with farrowing crates, concrete forms, and aeration equipment. McCrabb’s also manufactured fertilizer toters, fertilizer tenders, fire truck water tenders, and many drying bin and aeration parts that agriculture dealers needed for sales. In 1968 one of our contacts was saying what a hassle probing trucks with a hand probe is and how dangerous it is. This was the spark for the idea of a mechanical probe. 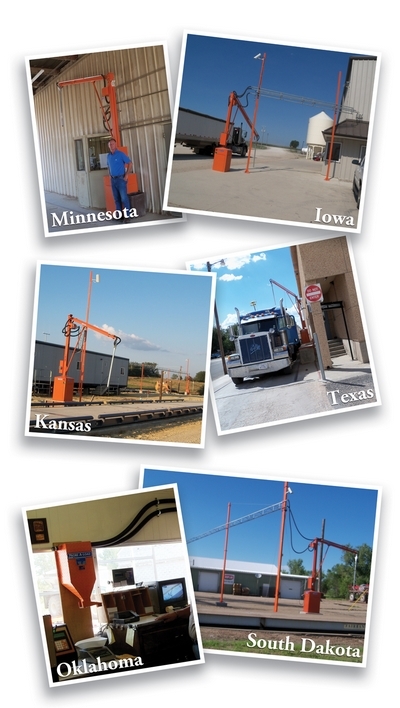 We contacted a customer about his interest in a mechanical probe to sample trucks. The customer was excited to have a truck probe that he didn’t have to do by hand. We spent about 6 months with a trial and error to end up with the first truck probe that was all electric, mechanical, and run by a remote control which was in the office. The product known as Probe-A-Load was born in 1969 when we started marketing in Iowa and Illinois. This was the beginning of the evolution of the truck probe known as Probe-A-Load. We have since sold hundreds of probes in the United States, Canada, Mexico and 28 other foreign countries. In the late 70’s , a seed company contacted us to provide a probe that was intended strictly for seed. As the stingers and collection housings at that time could damage a seed, it required a change. We spent the next 6 months developing, what is known today as the core sampler. The core sampler is an open tip device that does not have doors, any moving parts, or any collision points that might damage a seed, thereby delivering the best possible sample of what the seed condition is. This has continued to improve the design of the collection housing, which uses a dead head principle to handle the grain, and eliminate damage and noise. Changes in 1980 from a round to a square mast and handheld controls became the newest way of operating the machine. The shape changed, the power changed, and many minor improvements were made and continue to be made as per our customers demand. This step in evolution opened many new doors and created the need to have a federally approved sampling device that could be used at any sight. In the mid 80’s, this was accomplished with the FDA (Federal Department of Agriculture) coming to Iowa and conducting several hundred truck tests to determine the accuracy of the core sampler vs. gated and other types of sampling devices. This was accomplished with the assistance of Charlie Herberg from Iowa State University and the representatives from the FDA doing testing at Conroy, Iowa. This approval for federal sampling still stands and is available to any elevator desiring to be a federally approved market sight. In 1984, the company downsized and made the probe the primary product that was produced by McCrabb Probe-A-Load. This has brought to the market place an all electric, mechanical, plug-in appliance that is delivered to the customer ready to be plugged in to a standard dedicated line. Then the probe assembly is fastened in place, the air hoses are hooked up, and it’s ready to operate. The ease of installation is one of the features of our truck probe. It is available direct from the company and can be installed by our technicians or your own maintenance people. Standard on this unit are stop and go lights on each side, flood lights for night operation, and a signal horn to alert the driver that the sampling is complete. All of these features are run with a handheld control that is operated from within the scale house. The sample is pneumatically taken and ready for the operator to run his tests. Optional equipment available include, grain ticket return that is used to return the sample to the truck, a “ticket return” to speed scale traffic, and cameras with monitors. Our 2012 model is the 43rd year of production for this product. We often take a number of probes in trade for new ones that are over 40 years old. This represents the quality construction and type of equipment built by Probe-A-Load Inc. for the grain industry worldwide. We are still located in West Liberty, Iowa. Visit the Contact page for ways to reach us.